The K9 and 4th grade students were teamed up together. After the fourth grade students got an overview from Ms. Krauth concerning the various China and Indian river society characteristics, Ms. Fincher then reviewed the Place characteristics that the fourth grade students had been using for their first fourth grade unit of study. The objective of was to apply these two viewpoints to the 4th grade Fuchu Kyoto- no- Mori Museum field trip which covers the history of our local town of Fuchu which is situated on the banks of the Tama river. The students were then grouped into three large groups. They read a Japanese pictorial history book in the original Japanese and in the English translation. This book gave a pictorial overview of Japan’s development from a hunter-gatherer societal stage through the agrarian revolution which served as a common stepping off point for discussion between the buddy pairs. The Japanese picture book share in the high school. Back into individual pairs, the students discussed the commonalities between the Place characteristics and the river society characteristics. They constructed a Venn diagram which listed the most common and important correlates between the two viewpoints from their individual perspective. Finally, they wrote out a series of questions that they would like to tackle together after the fourth grade field trip to Fuchu-no-Mori. Stephanie and Katerina ponder on which one they want. Jenna and Kenji take a look at the Venn diagram. 1a. The Place correlates were the human aspects of government, language,communication and transportation. 2a. The Place correlates were the physical aspects of climate, land forms, plants and animals, and types of soils. 3a. The Place correlates were the human aspects of clothing, jobs, tools and art. 4a. The Place correlates were combined human and physical characteristics of buildings, technology, landforms and climate. Hiro, Jeff from 4-C and Shasha find some different uses for grass along the banks of the Tama. Day Two: The fourth grade students went on their field trip to the museum. 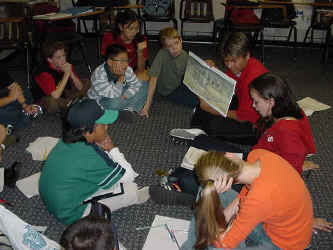 Previous to going to the museum, each student was placed the same river society group. As they went through the museum, they recorded what they saw that might help them answer their buddy question. Japanese speaking students translated for the others, guided readings by Ms. Fincher happened in each room to explain the historical context and parents took pictures of the students in front of artifacts that they thought were most representative of their question. After the fourth grade students got back from the trip, they sat down and shared their information with each other to help round out their knowledge. Justine works on her part of the jigsaw using her notes. Then, the fourth grade groups constructed informational text to go along the Place characteristics that went with their river society group. 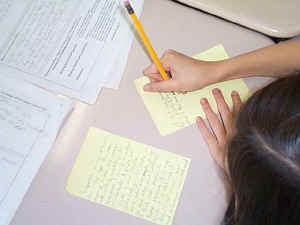 In the fourth grade classes, the students did this by using the jigsaw method of paragraph construction. 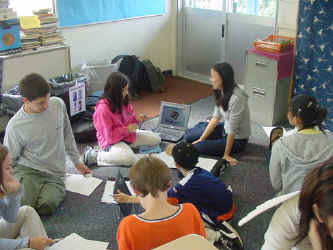 The ninth grade class later constructed their own form of informational text. It was a flurry of activity--that is for sure. Day Three and Day Four: The buddy pairs came together and constructed their sites. First of all, the fourth graders explained what they saw in the museum to their ninth grade partners in enough detail so that they would be able to see a link to the river society characteristics they were familiar with. The students talked about what they would like to put on the page and then the fourth graders geared up the laptops that are being piloted this year in the grade level. Taking turns, the students worked together for two days answering their questions using FrontPage 2000. Ms. Krauth shares a laugh with a couple of students. The fourth grade students start gear up the laptops. Page constructed and maintained by Bridgette Fincher. Photos by Bridgette Fincher and John Mikton.